If you looking for some of the Best Music Production Software then read on and I’ll be sharing some of the Best Music Production Software that will definitely help you to get done with the job. As you already know, it is quite hard to make music without a music production software. And choosing one of the music making Software is difficult too as there are many options available out in the market. Hence, I have decided to help you out. In this article, I’ll be talking about the 10 best music production software that will definitely help you to make some awesome music. So let’s just head into the topic without wasting time. Here I am going to list the Top 10 Best Music Production softwares which will help you to compose Professional music very easily. So let’s go ahead and check out the list of best music softwares for PC & MAC. At first, we have the Apple Garageband. You can consider this application as the best free music making Software. With Apple Garageband you are getting some cool features that include Drummer, an easy to use groove-maker, it comes in multiple genres styles. Also using this application is quite easy as it comes with various controls and a ton of patterns and fills variations. So consider checking the application out. Just in case, if you are looking for an online tool to make music then you should definitely try out the Audio tool. It allows you to make music directly from your browser. Also, the music production platform is completely free just sign up on the official website and you are good to go. The platform is based on flash allowing you to add music via a drag and drop feature. Also, the interface is quite easy and every time you add a new feature the visual of the hardware gets popped up on the screen. This helps you to understand the interface in a good way. 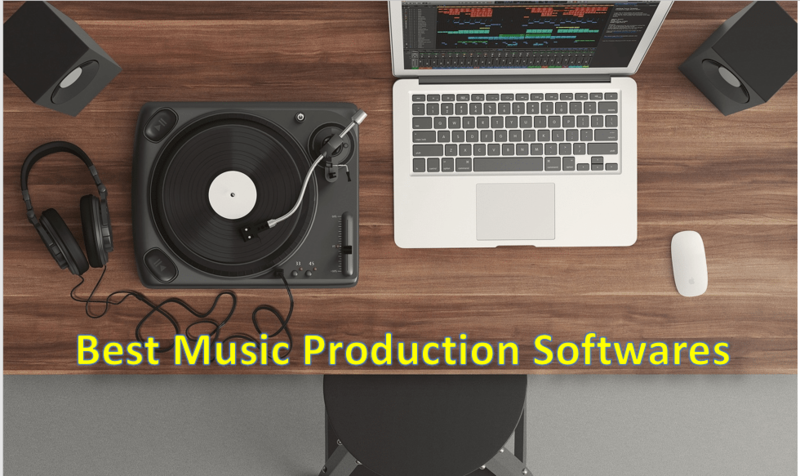 It is quite easy to use online music production software. So make sure you are checking this out. Up next we have the Logic Pro. However, the application is only available for the Mac users also the tool is not free. But it holds a sweet price tag and you can get the application from the Apple iTunes. Talking about the application, well it has an easy to understand interface also some free preloaded plugins. That will actually help you to make music. So consider having a look at it as well. I have handpicked another premium tool called Cubase. Well, the application is available on Windows and Mac platform. So, if you don’t want to go for the Logic Pro then you can try this one. Talking about the features, well the Cubase comes with VCA faders for complex mixing and automation workflows and many other features. The software is available on Amazon.com so go there and have a look at it. If in case you are a beginner and don’t want to crack your head up with different tools and features. Well, then you should try out the Audacity. It is one of the best free music making Software. Also, it is quite popular around the music creators. The user interface is pretty simple and lacks quite a lot of features. But it does the job in a good way. Also, it is available on all the platforms that include windows, mac, and Linux. Audio Sauna is another great platform when it comes to Online Music Software. The user interface of the website is pretty simple and based on flash. Also, the good thing about the platform is that you do not even need to sign up. Just visit the official website and you will get the music software. So consider having a look at this online tool. For our next suggestion, we have picked up the Reaper. It’s an extremely lightweight application. You can even install the software on Windows 32 bit application. Apart from the Windows application, it’s also available for Mac. Talking about the features, well it has a nice user interface and has almost all the tools that you will need. However, the application is not free but not also not that expensive. It holds a price tag of $60 which is extremely cheap yet Best Music Production Software comparing to the other options available in the market. If you are looking for a decent music making Software. Then consider having a look at the FL studio. The tool is not really expensive in fact it is one of the budget music production software you can get. Also, the application is available on Amazon.com. Talking about the features, well this tool also has all the popular yet recommended features and has a really nice interface. So consider having a look at the application. Mixxx is another great tool for the beginners. Even this is one of the best free music making Software that you can download. The application supports all the platforms that include Mac, Windows, and Linux. The application offers you a DJ mixing environment and supports all the popular music formats including Mp3 and various other formats. Magix Samplitude Pro X is an entry-level tool when it comes to a music making Software. Being entry level application it still offers lots of amazing tools and features that will definitely help you to get done with the job. It has a quite mind cracking user interface as it is filled with lots of features. The application is priced quite high but comes with a free trial. So in case if you are planning to buy the software then it is advisable to try out the trial version. So that was all for the Best Music Production Software for Windows & Mac. Leave your comments below and let me know which music software are you going to use to edit your next track? So these are the Top 10 Best music composing softwares for windows & MAC based computers. I hope you find this article helpful and if you like it then support us by sharing it with others by clicking on any social media icons given below. Did I forget to mention any music composing software which you think would be on the list? If so, then don’t get shy to tell me in the comment section given below.